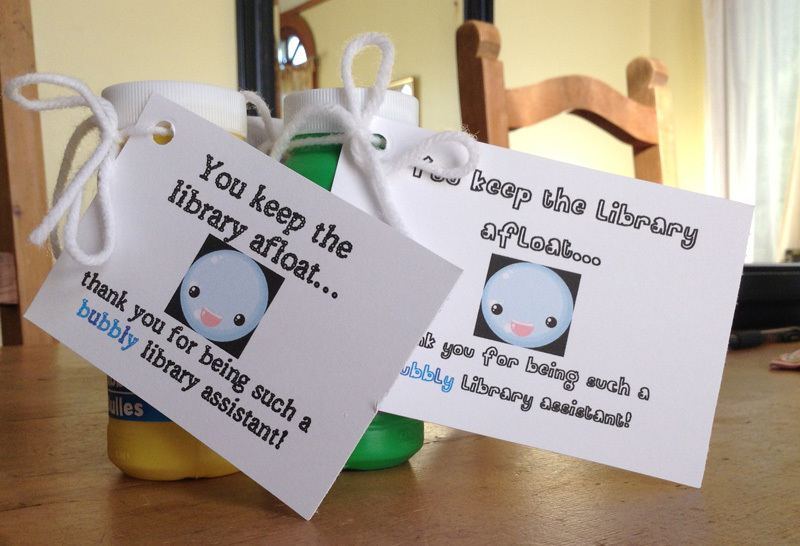 I have a team of student volunteers in the library who do everything from helping with circulation, to re-shelving books, to locating titles for their peers, to driving me nuts. Just kidding. They actually don’t drive me nuts too often, and they do do the other chores daily, and most of them are just so very sweet and lovable. Sometimes I get a stirring in my soul to do a little something to thank them, but my soul is penniless so I have to get creative. It’s just your basic dollar store variety of bubbles (3 packs for a dollar, that is), with a nice little note attached. I think I just googled “free bubble fonts” to get the writing right. And there you have it. My soul is satisfied, the sweet kids know they are appreciated, and my pocketbook remains solvent. Plus, believe me when I say tweens/teens love accessing their inner child (actually, it’s usually right under the skin begging to come out and play).